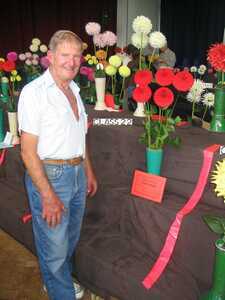 The Annual Show was very well attended. There were over 40 exhibitors from all over the country. 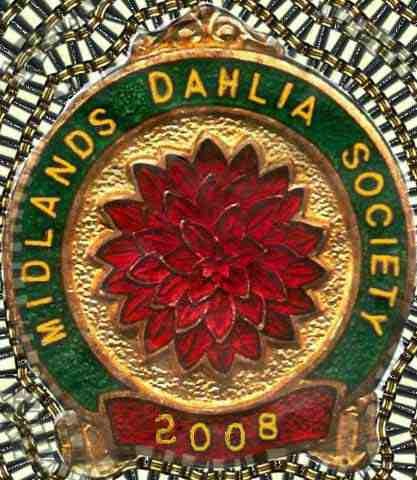 One of the many highlights of the show was Tom McLelland getting the National Dahlia Society Silver Medal from Joe Batten for all his work, breeding, showing and helping others with Dahlais. 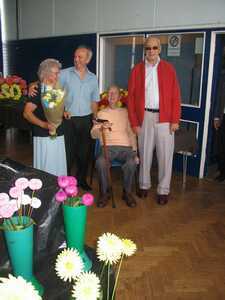 Tom and his wife with NDS chairman Joe Batten and MDS chairman Ron Guest. Tom McLelland shows off his silver medal with two of his 'creations' Weston Spanish Dancer in on the left and Weston Pirate is on the right. 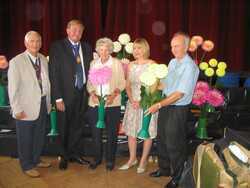 Best Vase in Annual Show and the Welsh Dahlia Society Silver medal were won by John Digweed with Barbarry Maverick,. 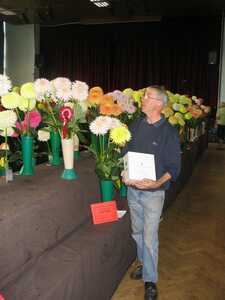 He also won the Welsh Dahlia Society Bronze medal for the best vase in the members entries. 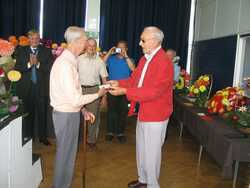 Both medals were donated by the WDS, specially for the 50th anniversary show, thank you. 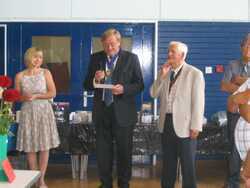 June Davis - winner of the Midlands Championship with society president, society chairman and the deputy mayor of Kenilworth and his wife. 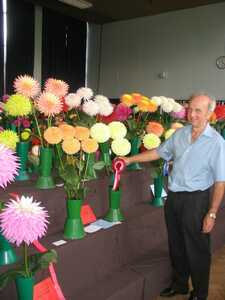 Ken Smart wins Class 34 ( five blooms Collerette dahlias) with Fashion Monger. Gabby Hayes wins Class 27 with Toy Boy. 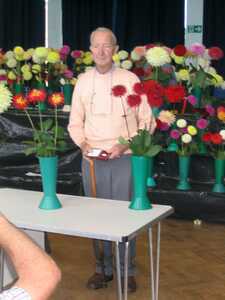 Peter Clubb wins the Styvechale Trophy with: Trellyn Kiwi, Oakwood Goldcrest, and Lemon Elegance. 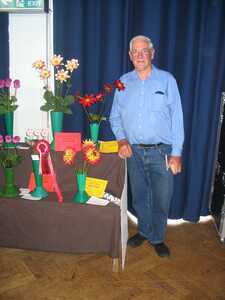 Ron Guest wins the Lady Godiva Trophy with: Trengrove Millenium, Gateshead Festival, Grenidore Pastelle and Trylen Kiwi.